Mr Shahram Kashani is a consultant ophthalmic surgeon at Eastbourne District General Hospital. 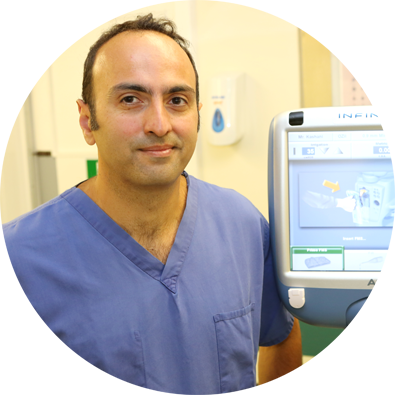 Mr Shahram Kashani is a consultant ophthalmic surgeon at Eastbourne District General Hospital. He is a general ophthalmologist with a specialist interest in complex cataract surgery with premium lens implant and management of challenging retinal disorders. He consults privately at BMI Esperance hospital in Eastbourne. His consulting room is fully equipped with modern state of the art equipment thanks to recent acquisition of an intraocular lens (IOL) master and Optical Coherence Tomography (OCT) retinal scanner. Mr Kashani is a UK trained ophthalmologist, graduating from St George’s Hospital Medical School in 1998. He has extensive experience in managing general ophthalmic pathology, having trained at various prestigious ophthalmic units in London including Kings College Hospital, Charing Cross and Western Eye Hospital, Chelsea and Westminister Hospital as well as 3 years at the world renowned Moorfields Eye Hospital where he was also selected and completed advanced subspecialty fellowship training in management of eye conditions including macular degeneration, Diabetic eye disease, retinal vein occlusions, inflammatory eye disease and complex cataract surgery. Mr Kashani has an active interest in research with over 40 peer reviewed publications and over 25 national and international presentations. Mr Kashani is a member of the European Society of Retinal Specialists (EURETINA) and European Society of Cataract and Refractive Surgeons (ESCRS) and attends national and international meetings regularly to keep his professional development with the latest technology in his field. He is one of only a handful of surgeons who has achieved the prestigious membership status of the Royal College of Physicians as well as obtaining the fellowship status from the Royal College of Ophthalmologists. Mr Kashani has won several awards for his teaching skills at Eastbourne DGH and has particular interest in developing the role of optometrists and nurse specialists in delivering modern ophthalmic care.